Rocking the latest car stereo is a good thing but nothing beats having the perfect head unit that works seamlessly with your preferred software platform (Android Auto or Apple Carplay). Granted , most head units support both Carplay and Android Auto which is actually good , however , if you pay close attention , you will notice they perform better with one software and not-so-good with the other. Car owners have put this into consideration when shopping for an aftermarket head unit and in this article , we’re going to reveal the best apple carplay stereo based on our findings. Also , if you’re looking for the perfect aftermarket head unit for your car , do have a look at our buyer’s guide on the top rated double din head units and high quality android auto head units. The best apple carplay stereo is non other than Sony’s XAV-AX100 and even though Sony launched the AX200 as its successor , the XAV-AX100 is still a favourite among car owners who use Apple Carplay. Over 90% of data we gathered testified to the fact that this head unit works seamlessly with Carplay as they experienced no lag or issues with the software. Android lovers are also not left out as the XAV-AX100 also supports Android Auto and its accompanying features. There’s one thing to note though ; this head unit dosen’t offer wireless Carplay experience so you’ld have to plug-in your iPhone via a USB chord. However , if you’re all about wireless carplay , do have at look at our #2 recommendation on this list. Now asides from Apple Carplay , what else does XAV-AX100 have to offer? It’s form factor is also impressive even though it has a smaller profile compared to other products in this category. Given its size, it can squeeze into even the smallest dashboards. The controls on the Sony XAV-AX100 are on the sides making them easy to access without interfering with other dashboard controls. It is one of the few Carplay stereos with a knob in the controls and this is an easier option if you decide to operate the device manually. Audiophiles will appreciate the 10-band equalizer with which you could customize your sound and have your clips boosted into different frequencies, the three outputs with which you could expand the sound setup using desired amplifiers and the dynamic stage organizer which creates virtual speakers on your dashboard. While all seems good, it’s just as important to note that the screen is only 6.4” which , to you , may not be so wide and the audio quality is not quite impressive. It offers just 5 channels instead of the standard 6, and even though its highest maximum output is offered at 55 watts, its stereo’s preamp can only push 17watts per channel. However, since it’s Sony, you know that you’re getting a trouble free device with quality control and one of the best customer support/guarantee. The next best apple carplay stereo is Alpine’s ILX-107 which is a major upgrade on the legacy ILX-007. Like previous models , the ILX-017 specializes in providing a native and intuitively designed interactive experience that Apple users are quite familiar with. This specialization has limited the versatility of Alpine as they don’t support any other Operating System asides Apple Carplay. However, their focus on this particular system has given them a significant credit in terms of stereo unit wireless connection. This is a very convenient feature as you don’t necessarily have to use a USB cable to connect to your phone. Apart from its seamless wireless connection capacity which apparently is its selling point, the interface is also easy to use. The 7-inch screen stereo unit has responsive capacitive volume buttons on the bezel which works for both calls and music volume control. Oddly, the screen itself could be a bit fussy, but this flaw is compensated by the other host of features it has to offer including the HD Radio, satellite radio, color choice selection and its capacity to pair with up to 5 phones over Bluetooth connection. Even with this compensation, it’s a bit pricey. However, if your major need is to get seamless wireless connection to your phone with all the features , then the Alpine ILX-107 is the go-to device. Single DIN units are usually smaller in dimension in comparison to double din units. However, with the Pioneer AVH-3300NEX, you get a double DIN experience on the single DIN unit in a more convenient and space conservative platform. This makes it one of the fewest and cheapest solutions for vehicles with 7 by 2 inch stereo spaces with owners who want more than the single din experience. It connects seamlessly to both Apple CarPlay and Android Auto, so there’s really not much to be missed in using this device. It has a fold-out touch sensitive screen with an easy-to-use CD player, as well as many other features which are impressive for a single DIN unit. The features include a satellite radio, Siri Eyes Free as well as lots of entertaining and convenient apps. This complexity doesn’t affect its common functions such as the handy volume knob and the buttons on the front region for the common functions such as pause, play, among others. Given the basic dimension of single din units, the Pioneer 3300 extends about 4 inches above the stereo to give you an interface similar to that of a double din unit. However, the design contains a lot of mechanical complexity with which an array of things could go wrong if you’re not careful. It’s also best to have the screen tucked in when driving on bad roads, or when non-consenting kids are in the front seat. 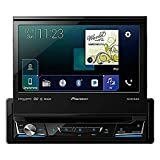 If you prefer to have a double din integrated into a single din space instead of reconfiguring your car’s dashboard from scratch, then you would have no regrets in buying this stereo unit. The DNX694S is our top pick in the navigation category given its integration of the Garmin navigation system. Garmin is a very prominent brand in the navigation market with their GPS watches and other navigation devices. The merging of their technology with Kenwood Excelon DNSX694S is just genius. Apparently, the best thing about the navigation system used in this model is that it works seamlessly even in areas with poor cellular reception. In such areas, even phone-based mapping is not trust-worthy. The Kenwood adapts a split screen in its display such that you go about other stereo businesses while the navigation gives you turn-by-turn directions on the other side of the split. Other interesting features include the customizable backlight, audio info and playback controls and two USB ports on the rear with which you could connect both Android Auto and Apple Carplay. In this connection you can charge one while connected to the other. There’s also a HD Radio as well as other video inputs and outputs for other relative connections such as amplifiers, cameras or even rear-seat DVD screens. The downside to the Kenwood DNX694S is that the menus are quite complex and this can be a distraction while driving. Some users have also frequently complained about the responsiveness of the screen. However, if you’re more interested in a seamless navigation system and you could manage your other interests with the phone connection, then this product is for you. As the best budget pick, you’d expect this JVC model to be the most cost-effective option, and that’s exactly what it is. The JVC brand is famed for its quality audio delivery as they have maintained an impressive dominance on that niche of the market for the better of the past decade. Its preamp provides the standard 6 channels with 50 watts as the maximum output and 22 watts per channel. This is one of the major selling points of this particular JVC model. It is often regarded as a better alternative to the SONY XAV-AX100 even though it costs the same. This statement is backed by its large 6.8inch display which has been commended to be clearer and brighter. It also has HD radio stations and you can connect to a SiriusXM receiver for satellite radio. More interestingly, you can synchronize to two devices simultaneously and easily transition from one to the other seamlessly. The downside to using this device is that it lacks Siri Eyes Free and the buttons for volume control are tiny and hard to use compared to the more preferred knobs. It also has fewer preset stations and just one USB and auxiliary input which limits it in terms of versatility. To crown it all, it is restricted to playing audio file formats at the expense of video files. Apart from those downsides, you could conveniently access other basic functions featured by most stereo units such as navigation, impressive display interface among other things. It’s also one of the cheapest double din devices on the market, so it’s a very cost effective option especially for audiophiles. Buyers Guide – What should be your considerations? Throughout the reviews, we have specified the major strengths and weakness of the products, making it quite easy for you to choose according to the features that really interest you. However, shutting your eyes to the other necessities would invariably cost you your convenience in the nearest future (after purchase). Take your time to go through these buying considerations and redefine your focus towards a healthier plan to get a cost-effective option that also supports your more particular interest. Most devices are more particular to certain mobile phone operating systems, thereby putting a lid on versatility as it seems. There’s no doubting that the Apple operating system has more impressive features, but when you take a more considerable look at the progress of mobile devices over the years, you’ll notice that Android and other Operating systems are not very far behind. Therefore, whichever device you intend to choose, make sure that it at least supports Android Auto too in addition to the most primary operating system – Apple Carplay. The use of wired connections from your phone to your car stereo is quite old and less convenient. A more developed, mature and more convenient adaptation is the ability to connect any phone seamlessly and wirelessly to the stereo device. Not only is it more convenient, but in a way, it also increases the versatility of the device as you can have any device connect to it without battling with cords and USB spaces. Simply put, the least acceptable screen size is 6.5 inches of sensitive screen, with a 480 resolution supporting a 16:9 ratio. Also, the illumination should at least be a LED backlit technology as it consumes less power from the cars power source and is less likely to have glitches. Most of the vehicle users interested in stereo devices are audiophiles and having less than a commendable audio output is just unacceptable. Whichever device you eventually choose must have a solid input amplifier for better sound output. The power provision should be no less than 4 channels compared to the standard 6 and nothing less than 15 watts compared to the maximum being 20 watts. Having considered these, you can then be specific about the quality of the navigation system, the sensitivity of the touchscreen, radio adaptation, connection to cameras and other back seat display units.